In the Catholic Church, a consecrated virgin has been consecrated by the church to a life of perpetual virginity as an exclusive spouse of Christ. Consecrated virgins are consecrated by the diocesan bishop according to the approved liturgical rite. The consecrated virgins are to spend their time in works of penance and mercy, in apostolic activity and in prayer, according to their state of life and spiritual gifts. The rite of consecration of virgins living in the world was reintroduced in 1970, under Pope Paul VI, in the wake of the Second Vatican Council. It is based on the template of the practice of the velatio virginum going back to the Apostolic era, especially the early virgin martyrs. The rite of consecration of virgins for nuns who have made their final profession of vows has always existed in various forms from the time of St. Scholastica. This is not to be confused with the Rite of Profession; it was an additional consecration. The 1983 Code of Canon Law and the 1996 Apostolic Exhortation Vita Consecrata by John Paul II speak of a reflourishing "Order of Virgins" (Ordo Virginum), the members of which represent an image of the church as heavenly Bride. The number of consecrated virgins ranges in the thousands. While the Holy See does not keep official statistics, estimates derived from diocesan records range at around 5,000 consecrated virgins living in the world as of 2018. In view of growing interest in the vocation, and of the upcoming 50th anniversary of its formal institution, the Congregation for Institutes of Consecrated Life and Societies of Apostolic Life issued the instruction Ecclesia Sponsae imago in July 2018.. While consecrated virginity resembles married life, a consecrated virgin may be part of a monastic community or continue live “in the world” to be a part of her local parish, under the authority of her bishop, in service to the people of God in her diocese and globally. Consecrated virgins should not be confused with consecrated anchorites or hermits, who have a different vocation. Triumph of Chastity: an allegory of the virtue of Chastity is standing on a wagon drawn by two unicorns; her train of virgin is led by one holding a banner bearing the emblem of the white weasel or ermine, symbol of chastity in medieval tradition (Master of the Paris Entries, c. 1500–1520). The Christian concept has a precedent in the Vestal Virgins of ancient Roman religion. Chastity is one of the Seven Virtues in Christian tradition, listed by Gregory the Great at the end of the 6th century. Praise of chastity or celibacy, both male and female, as a religious virtue is already present in the New Testament, especially in 1 Corinthians, where Paul the Apostle suggests a special role for virgins or unmarried women (ἡ γυνὴ καὶ ἡ παρθένος ἡ ἄγαμος) as more suitable for "the things of the Lord" (μεριμνᾷ τὰ τοῦ κυρίου). In 2 Corinthians 11:2, Paul alludes to the metaphor of the Church as Bride of Christ by addressing the congregation "I have espoused you to one husband, that I may present you as a chaste virgin to Christ". In Christian hagiography, there are numerous accounts of pre-Nicaean virgin martyrs, such as Margaret of Antioch, Agnes of Rome, Euphemia of Chalcedon and Lucia of Syracuse. In the theology of the Church Fathers, the prototype of the sacred virgin is Mary, the mother of Jesus, consecrated by the Holy Spirit at Annunciation. Although not stated in the gospels, the perpetual virginity of Mary was widely upheld as a dogma by the Church Fathers from the 4th century. The tradition of a ritual form of the consecration also dates to the 4th century, but it is widely held that a more informal consecration was imparted to virgin women by their bishops dating from the time of the Apostles. The first known formal rite of consecration is that of Saint Marcellina, dated AD 353, mentioned in De Virginibus by her brother, Saint Ambrose. Another early consecrated virgin is Saint Genevieve (c. 422 – c. 512). During the medieval period, the rite of consecration was maintained by nuns in monastic orders, such as the Benedictines and Carthusians. This consecration could be done either concurrently with or some time after the profession of solemn vows. Among Carthusian nuns, there is[year needed] the unique practice of these virgins being entitled to wear a stole, and a maniple, vestments otherwise reserved to clergy. Typically, mendicant nuns did not have the tradition of receiving the consecration of virgins but were content to have perpetual vows. Saint Margaret of Hungary (1242–1270), a Dominican nun, is a special case insofar as she received the consecration of virgins despite the Dominican tradition of not receiving this consecration; this was done because her father, king Béla IV of Hungary, had her solemn vows dispensed by the pope for the purposes of a political marriage. The consecration of virgins put a stop to this as it could not be dispensed. The modern revival of the rite of the consecration of virgins in the Catholic Church for women living outside of religious communities is associated with Anne Leflaive (1899–1987). The consecration of virgins after the fashion of the ancient Church was supported by certain French bishops in the early 20th century. Leflaive was directed towards this vocation by François de Rovérié de Cabrières, the bishop of Montpellier. She received the consecration in the chapel of Carmel at Paray-le-Monial on 6 January 1924, on her 25th birthday, by the bishop of Autun, Hyacinthe-Jean Chassagnon. There was an increasing demand for such consecrations in the 1920s, and bishops requested clarification from the Congregation for Institutes of Consecrated Life. The reply given on 25 March 1927 was in the negative. The Congregation forbade the revival of this type of consecration. The 1927 decree argued that the consecration of virgins "living in the world" (in saeculo viventes) had long fallen out of use, and was in contradiction to the then current Canon Law of 1917. It was also argued that the official sanction of a vow of virginity in a "very imposing ceremony" might risk to lead the women so consecrated to judge their status as superior to those of nuns, whose solemn vows are not accompanied by similar ceremonies, and even to divert some women who would otherwise have chosen a monastic vocation. It was significantly due to Anne Leflaive's efforts over the following decades this ban was eventually rescinded in 1970. In 1939, Leflaive founded the secular Missionaries of Catholic Action, an institute of celibate women or widows living in the world, which was, however, suppressed in 1946. Beginning in the 1940s, Leflaive was in contact with Angelo Roncalli, the future Pope John XXIII and with Giovanni Montini, the future Pope Paul VI, who were receptive to her ideas. During the 1950s, Leflaive visited Rome once a year in order to lobby at the Vatican for the re-instatement of the rite of consecration of virgins. Leflaive published Study of the Consecrations of Virgins in the Roman Pontifical in 1934, re-edited as Espouse du Christ in 1956, and as La Femme et l'Eglise in 1968. At a time where the Reformed confessions began to introduce the ordination of women, Leflaive strictly rejected such a possibility, arguing that "Christ and His Church offer to the woman a gift of great plentitude [sic]" in the form of the Consecration of Virgins, already inscribed in the Roman Pontifical. In 1950, Pius XII issued Sponsa Christi, an Apostolic Constitution addressing the vocation of consecrated women and their mystical engagement with Christ. "Because of their consecration by the diocesan Bishop, they acquire a special bond with the Church, to which they devote their service, even if they remain in the world. Alone or in community they represent a special eschatological image of the heavenly bride and the future life, when the church will finally live the love of her bridegroom Christ in abundance." Pius XII in 1950 decreed that only nuns living in reclusion were permitted to receive the formal consecration of virgins. In 1954, Pius cited Sponsa Christi his encyclical Sacra Virginitas as showing the importance of the office consecrated men and women fulfill in the Church. "This then is the primary purpose, this the central idea of Christian virginity: to aim only at the divine, to turn thereto the whole mind and soul; to want to please God in everything, to think of Him continually, to consecrate body and soul completely to Him." In 1963, the Second Vatican Council requested a revision of the rite of the consecration of virgins that was found in the Roman Pontifical. The revised Rite was approved by Pope Paul VI and published in 1970. This consecration could be bestowed either on women in monastic orders or on women living in the world, which revived the form of life that had been found in the early Church. The 1970 Ordo Consecrationis Virginum states the following requirements for women living in the world to receive the consecration: "that they have never married or lived in open violation of chastity; that, by their prudence and universally approved character, they give assurance of perseverance in a life of chastity dedicated to the service of the church and of their neighbor; that they be admitted to this Consecration by the Bishop who is the local Ordinary." Consecrated virgins living in the world belong to the consecrated life. They are not supported financially by their bishop, but must provide for their own upkeep. These women work in professions ranging from teachers and attorneys to that of firefighter. Some lead lives of contemplation as hermits. The number of consecrated virgins under the 1970 rite of consecration has grown into the thousands over the course of four decades. As of 2008, the United States Association of Consecrated Virgins (USACV) gave an "educated guess" of a total number of 3,000 consecrated virgins in 42 countries. In a 2015 survey, the Congregation for Institutes of Consecrated Life and Societies of Apostolic Life (CICLSAL) established an estimated number of 4,000 consecrated virgins in 78 countries, with a growing tendency, with a projected increase to about 5,000 by 2020. 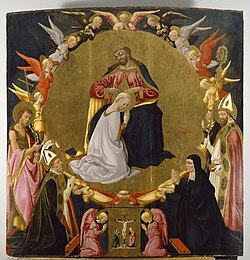 "The entire tradition of the Church has firmly upheld that a woman must have received the gift of virginity – that is, both material and formal (physical and spiritual) – in order to receive the consecration of virgins"
By the rite of consecration the diocesan bishop sets the virgin apart as a sacred person. The virgin who receives the consecration is elevated to the consecrated state, which she shares with religious and diocesan hermits. She becomes a member of the Order of Virgins, just as deacons belong to the Order of Deacons. The consecration of virgins living in the world is reserved to bishops alone because bishops represent Christ the bridegroom and it is to their care virgins are entrusted, who are the images of the church. Anne Leflaive (1899–1987), consecrated in 1924 in France, campaigned for bringing about the renewal of the Rite of Consecration during the 1920s to 1960s. Wendy Beckett (1930–2018), known as "Sister Wendy", a former member of the religious congregation of Sisters of Notre Dame de Namur, became a consecrated virgin in 1970, and, though living as a recluse, supported herself through her work as a world-famous art critic. Joan Frances Gormley, (1937–2007), a consecrated virgin and American scholar in the fields of classical literature and biblical studies. She was a professor in the Department of Sacred Scripture at Mount St. Mary's Seminary. She translated and produced a number of works by leading Catholic mystics, such as Saints Edith Stein and John of Avila. ^ a b c Ordo Consecrationis Virginum (31 May 1970), AAS 62 (1970) 650 = EDIL 2082-2092 = DOL 294 no. 3352. English translation: The Rites of the Catholic Church 2 (n. 29, p. 81), 132-164, DOL 395 nos. 3253-3262. The Rite of consecration of virgins who belonged to monastic communities without their own proper Rite was revised and published as the variant of the Rite of consecration to a life of virginity in the 1970 Roman Pontifical. See also: "Ordo Virginum-The Order of Virgins". Office for Religious- Archdiocese of Dublin. 2015-08-06. Retrieved 2018-01-01. ^ a b João Braz de Aviz, José Rodríguez Carballo, Instruction “Ecclesiae Sponsae Imago” on the “Ordo virginum”, published 4 July 2018, dated 8 June 2018 ("Approved by the Holy Father in an audience on June 8, 2018"). Paragraph 88: "In vocational guidance and when there is need to describe the characteristics of this vocation and the requirements for admission to consecration, the condition of virginity will be presented starting with the rich symbolism of its biblical foundations, within the framework of an anthropological vision solidly based on Christian revelation. On this basis the different dimensions, physical, psychological and spiritual, are integrated and considered in their dynamic connection to the lived history of the person and in openness to the unceasing action of divine grace that directs, guides and invigorates her on the path of holiness. As a treasure of inestimable value that God pours into clay vessels (cf. 2 Cor 4:7), this vocation is truly an undeserved gift. It encounters the person in her actual humanity, always in need of redemption and yearning for the full meaning of her existence. It finds its origin and dynamic centre in the grace of God, who unceasingly acts with the tenderness and the strength of his merciful love in the often complex and sometimes contradictory events of human life, helping the person to grasp her uniqueness and the unity of her being, enabling her to make a total gift of self. In this context it should be kept in mind that the call to give witness to the Church’s virginal, spousal and fruitful love for Christ is not reducible to the symbol of physical integrity. Thus to have kept her body in perfect continence or to have practised the virtue of chastity in an exemplary way, while of great importance with regard to the discernment, are not essential prerequisites in the absence of which admittance to consecration is not possible. The discernment therefore requires good judgement and insight, and it must be carried out individually. Each aspirant and candidate is called to examine her own vocation with regard to her own personal history, in honesty and authenticity before God, and with the help of spiritual accompaniment." ^ AAS 19, 15 March 1927. ^ "Maroto ritiene che l’antico uso di conferire la Consecratio Virginum a donne in saeculo viventes sia stato o espressamente abolito da leggi ecclesiastici o caduto in disuso da molto tempo; inoltre, rileva che il Codice di diritto canonico all’epoca vigente non contiene alcuna norma a questo proposito, per cui la disciplina applicabile è solo quella desumibile dal Pontificale, anzi l’antica disciplina della Consecratio Virginum risulta essere inconciliabile con le norme giuridiche allora vigenti: innanzitutto, per il CIC/1917 solo lo stato religioso, con la professione dei tre consigli evangelici e la vita in comune, può dare un riconoscimento canonico pubblico; inoltre, solo il voto solenne di castità costituisce un impedimento matrimoniale dirimente e solo i membri di Ordini religiosi approvati possono emettere questo voto, per cui l’impegno di una vergine consacrata in saeculo viventes è equivalente a un voto semplice, privo di efficacia irritante di eventuali nozze, pur non essendo un voto privato e segreto. Jombart, pur ammettendo il valore della scelta verginale anche fuori del contesto della vita religiosa, sostiene che essa non può procurare tutti i mezzi di perfezione che si trovano invece nella clausura, nella vita in comune, nelle costituzioni e nella paterna vigilanza dei superiori; inoltre, il ricevere la consacrazione in una cerimonia molto imponente, può indurre le consacrate che vivono nel mondo a giudicare il loro stato superiore a quello delle religiose, distogliendo anche qualche donna dall’entrare in monastero." Katiuscia Scarpone, L'Ordine Delle Vergini, Sviluppo Storico e Profilo Canonico, Pontificia Università Lateranense, Instituto Teolotico Marchigiano (2003/4), 31f., citing F. Maroto, Sacra Congregatio de religiosis. De consecratione virginum in saeculo degentibus, CRM (1927), 160f. ; E. Bolchi, La consacrazione nell'Ordo Virginum. Forma di vita e disciplina canonica, Pontificia Università Gregoriana (2002), 32–34. ^ Roux, Jacqueline, Anne Leflaive: Une vie pour la renaissance d’une vocation oubliée (2004), English summary: consecratedvirgins.org. ^ Pope Pius XII. Sacra Virginitas, §3, March 25, 1954, Libreria Editrice Vaticana. ^ Sacred Congregation for Divine Worship, Decree promulgating the new rite for the consecration of a virgin, 31 May 1970, AAS 62 (1970) p. 650. ^ "It is a source of joy and hope to witness in our time a new flowering of the ancient Order of Virgins, known in Christian communities ever since apostolic times. Consecrated by the diocesan bishop, these women acquire a particular link with the Church, which they are committed to serve while remaining in the world. Either alone or in association with others, they constitute a special eschatological image of the Heavenly Bride and of the life to come when the Church will at last fully live her love for Christ the Bridegroom." Vita Consecrata, Apostolic Exhortation by Pope John Paul II, 25 March 1996. ^ "Who are consecrated virgins? | United States Association of Consecrated Virgins". Consecratedvirgins.org. Retrieved 2016-07-17. ^ Ann Treneman (1996-11-05). "The Vatican's virgin soldier | Lifestyle". The Independent. Retrieved 2016-07-17. ^ Olivia Rudgard, "Consecrated virgins need not be virgins, says Vatican", The Telegraph, 16 July 2018. ^ sec1 tit1 CIC II.I De Christefidelibus, Can. 604 § 1. Hisce vitae consecratae formis accedit ordo virginum quae, sanctum propositum emittentes Christum pressius sequendi, ab Episcopo dioecesano iuxte probatum ritum liturgicum Deo consecrantur, Christo Dei Filio mystice desponsantur et Ecclesiae servitio dedicantur. § 2. Ad suum propositum fidelius servandum et ad servitium Ecclesiae, proprio statui consonum, mutuo adiutorio perficiendum, virgines consociari possunt. Elena Lucia Bolchi, La consacrazione nell'Ordo virginum: forma di vita e disciplina canonica, Tesi Gregoriana, Serie Diritto Canonico 56, Rome (2002). Catechism of the Catholic Church (1993) §922 "Consecrated Virgins and Widows"
Catechism of the Catholic Church (1993) §2337-2359 "The Vocation to Chastity"